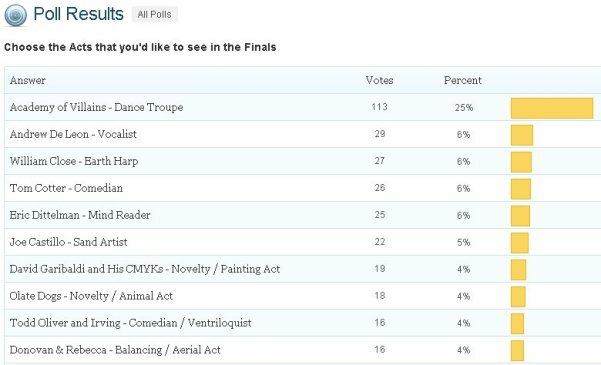 Just as I have done in the previous semifinals post I will simply post what I originally thought of the three acts that have made it through into the finals and what I would like to see happen. Of the poll’s Top Ten… eight of them were in the first semifinal… that can not bode well. In fact the three that made it through to the finals placed third (William Close), fourth (Tom Cotter) and sixth (Joe Castillo). So within the Top Six, not too bad. She got two of the three acts right, but in her “top six” as opposed to her “top three”. Not too bad. Interestingly enough three of the four acts appeared to have stepped up their game enough for Katie to place them in the top four. Lindsay however, was in the middle of the pack for Katie. Where was Bandbaz Brothers in the original poll? Oddly enough at the bottom of the poll.. interesting. All That: What they pulled this week was inventive and fun to watch. The stripping wasn’t too bad either. What I like about this group is that there are ways to turn a group into a full one hour show. There is that much flexibility where they could dance a full group of seven or in smaller groups or even as individuals… This is going to be an interesting to see what else they could bring to the table after this though. I would love to see lots of layers of dance and the numbers of people dancing so we’ll see. In the end it would be largely dependent on what they bring onto the table come the Semi-Finals that would help decide how they will do. Todd Oliver and Irving: Oh Em Gee. I am really liking this comedy act. Now that Todd Oliver has changed up his jokes and did something topical he is really drew my attention. One issue, he could create really slick jokes without having to be topical but it is nice to have that as a part of his repertoire. In fact the other comedians that have come through thus far had really good material and haven’t even touched the surface of current events. So I would be curious to see what else Todd and Irving could bring to the plate that would be entertaining, because right now I am not 100% sure he’d make it to the finals, but he could give others a run for their money as long as he stays on this upswing. Andrew De Leon: I would have to agree with Katie when it comes to Andrew, I think he has a magnificent voice and a really good story to boot, but honestly with the talent as tight as it is this season and polished to boot I really don’t think that Andrew will stand a chance. Unless he brings something absolutely mind-blowing to the table during the semi-finals, I really don’t see him progressing any further. However, he has the natural raw talent and in all honesty he could come out on top in the end… he is a “diamond in the rough” and with time and training could really polish and shine down the road. And I intend to be towards the front row when he gets there. Side Note: Maybe he and Prince Poppycock could duet together… I’ll pay to see that! Sebastien “El Charro de Oro”: As I have mentioned before I have never been a fan of children on this show… I really don’t like the idea of a pre-teen or younger having a full one hour show revolve around them. That being said Sebastien is rather entertaining and I am curious to see what else he could bring onto the table, however, he still has a lot of growing and polishing to do. I am curious to see how far he can go but I would be surprised if he makes it to the Finals. Ben Blaque: I disappointed that he didn’t get through before now, because I feel like his acts are always daring, and different every time. It was another great act tonight, but unfortunately, a bit slow for some reason. He did deliver, however, and pulled off his stunt successfully. The judges and audience seemed to like him, but I wasn’t as impressed tonight as usual. I’m split on whether or not I think he’ll go through. Spencer Horsman: Escapes are always exciting, and he definitely outdid his last performance (but really, was that hard to do?) I knew he was going to get out in the end, but my breath was definitely being held until I saw him emerge from the tank. He outdid himself tonight, and I’m glad he had a chance to come back and redeem himself. Todd Oliver and Irving: I wasn’t super impressed last time. His jokes really didn’t make me laugh. Right of the bat though, it was apparent that he took Howard’s advice to make it topical and relateable to the audience, and I think he hit it right on the head. The jokes had the audience laughing, and I was laughing out loud. His first joke was a zinger, and it continued on from there. He is probably my top pick. We’ve had ventriloquism, but this is different than what we’ve seen in the past. LOVED IT. If he doesn’t get through, I will be very disappointed. You could tell he was so excited about the response he got from the audience and judges. Horse: Why did Howard bring this back? I hate this act, and I don’t think it’s worth 1 million dollars. Who in their right mind would ever pay for this act? I couldn’t hardly stand to watch it — if it wasn’t my responsiblity to watch it, I would have changed the channel. What shocked me even more was how much the judges loved it. For a show that is supposedly “family friendly”, this was far from it. Maybe I’m just old fashioned and lame, but I really, really hate this act (I can hardly stand to even call it that). Please America, don’t vote him through and let the more talented people through. All That! : I’ll admit, I loved the projection behind them. I thought it was pretty cool. However, this wasn’t my favorite act of the night. They did a great job, but on a night where there were quite a few incredible acts, they didn’t quite match up. Bandbaz Brothers: It goes without saying that this act is incredible. I’m still trying to figure out how they did what they did, and wondering how they didn’t get through in the first place. It was breathtaking, and I hope they’ll go through so we can see what else they can do! Jake Wesley Rogers: His downfall last night ws in the song choice, so I hoped he would pick a better song tonight. And I think he did. But even with the better song choice, I think he was among the bottom tonight. He definitely has a killer voice, but I’m not sure if he’s what America is looking for right now. Howie and Howard were right on with his comments. It’s just not his time to be the winner of a AGT. There was a bit of a disconnect between him and the audience, but there are some better acts going on in this competition, and tonight especially. Lindsey Norton: Originally, I really liked Lindsey. But, plain and simple, I’d be very surprised if she went through. On a night of thrill, danger, and excitement, her act fell short. That’s not to say she did a bad job. Because she didn’t. On the contrary, she did an amazing job. She is very graceful, and has so much talent. But much like All That!, it wasn’t super memorable, especially compared to other acts from tonight. The good news is, she is young, and I do think she has a good career ahead of her. It’s just not her time to shine. Andrew De Leon: Okay, here’s the thing. He has an incredible voice. His story is pretty neat. I, myself, was quite shocked when he stumbled in Las Vegas, costing him a trip to the Top 48. And tonight he once again showed that a strong, powerful voice he has. But I just don’t think he should go through, and I know I’m likely in the minority thinking that. There was just something about his performance that I didn’t really like. Maybe it was the song, maybe it was his outfit, I have no clue. He seemed to get a great response from everyone though, so I won’t be terribly surprised if he gets through. Sharon seems to think he is going to win now. Jarrett & Raja: First time they performed? Loved them. Last time? Very disappointing. How did I feel after tonight? They were back, and better than ever. It was very entertaining, and was quite mind blowing. I’m so glad that they really made their act better, and they definitely redeemed themselves. They could go through, but I think there were a few acts that might push them out of that top four. Sebastian El Charro: It was entertaining. I thought his outfit didn’t really fit his song, but I guess that is kind of his trademark, so whatever. He has a very, very powerful voice. He defintitely showed that he is dynamic and can sing more than just Latin music. We do have a few children-singers in the competition, which may hurt him. For some reason, none of the “traditional acts” from tonight really stood out to me as memorable, just because of the high level of excitement some of the other acts have. We’ll see though. Cristin Sandu: I thought it was unfortunate that last time, his act kind of failed him, so I was very excited that Howie brought him back. fire was awesome, I was very nervous when the metal started to fall, and my heart dropped when he fell. Not only because there was fire. It was a great act, and I feel bad for him because he probably won’t go through, but it was exciting and if it was up to me, he’d be back, because i think he has a lot of potential. I think what Sharon said about how he escaped it all was really amazing. I think that a lot of people will hold it against him that he fell this time, and the last, so I don’t think he’ll go through. But he definitely has done some amazing things during his time on AGT.